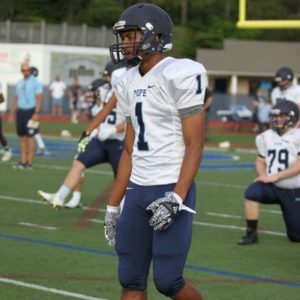 Owens is a no doubt FBS talent and one of the absolute best players in the state of Georgia at his position. Over the last year, he’s gained 15 pound, added an inch to his frame and really added another gear. He dropped his shuttle down. Owen has been a starter since his freshman year at Pope, and has consistently been one of the best athlete in his class from Cobb County. His long running stride picks up yards in massive chunks. His frame suggest he can add another 15 pounds and still be plenty fast. In fact his weight lifting numbers suggest he could really make another significant leap athletically in the next few years. Owens is a no doubt P5 football player. He has insane hand-eye coordination, and still increasing his vertical jump each 6 months by a few inches. Now up to 34″, expecting him to add another 3-4 in the few years. He shows elite running instincts with the ball in his hands too, balance has really improved too. Even increased his GPA in the last year.